An animation is a sequence of images, or frames, that is displayed over time. Each frame varies slightly from the preceding frame, creating the illusion of movement or other changes when the frames are viewed in quick succession. The term tweening is derived from 'in betweening', the traditional animation term used to describe this process. Tweening significantly reduces the time required to create animation effects such as fading in or fading out, or moving an element across a frame. 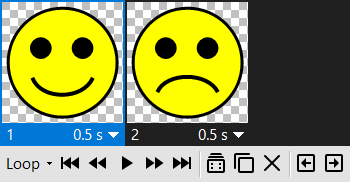 You can edit tweened frames individually after you create them. You use the Tween command to automatically add or modify a series of frames between two existing frames-varying the layer properties (position, opacity, or rotation angle) evenly between the new frames to create the appearance of movement. For example, if you want to fade out a layer, set the opacity of the layer in the starting frame to 100%; then set the opacity of the same layer in the ending frame to 0%. When you tween between the two frames, the opacity of the layer is reduced evenly across the new frames. The Duplicate Frame command allows you to duplicate the currently selected frame. The Delete Frame command allows you to remove the currently selected frame. The Move Frame Left command allows you to move the currently selected frame one position to the left. The Move Frame Right command allows you to move the currently selected frame one position to the right. The Reload Image command allows you to reload the original image.